We could all use a little diet reframing this time of year, myself included. My body is sassy. I can’t blame her. I’m a lot to deal with. These are perhaps the prettiest 30-minute spring rolls on the block because the exterior isn’t traditional rice paper – it’s collard greens! I know. So cool. Before you get intimidated and run the other direction, screaming, “What’s a collard green and what do I do with it?” – don’t. Collard greens make such a nice swap for traditional rice paper because they’re sturdy, bendable, and insanely healthy (plenty of vitamins A, K, + C). 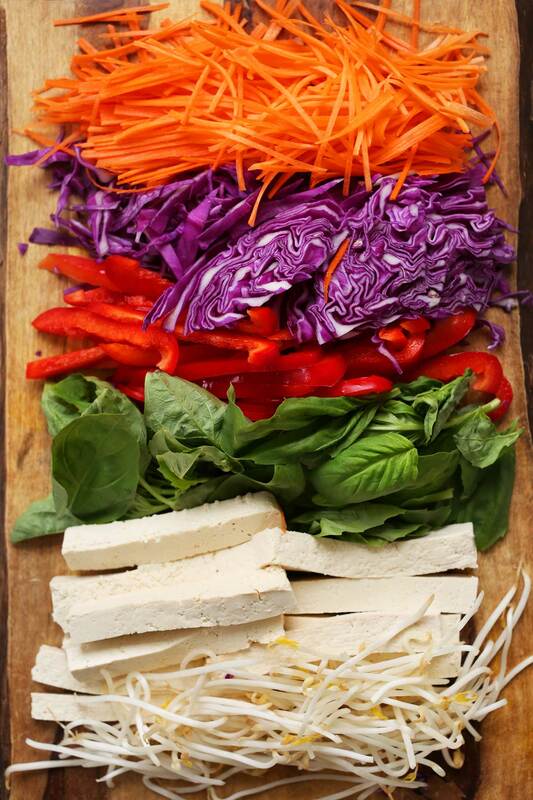 Next comes an array of super fresh, filling ingredients like firm tofu, basil, red pepper, cabbage, carrot, and bean sprout. 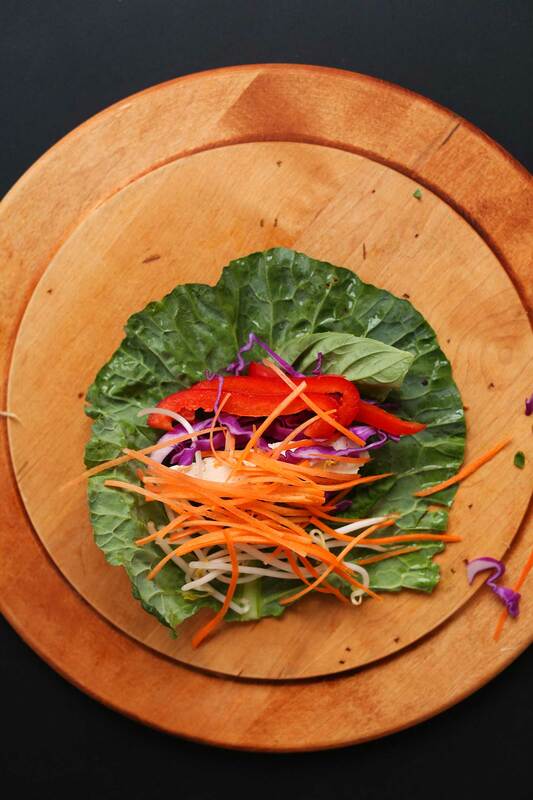 Roll it up into a spring roll shape – you got this – and then it’s onto the sauce. The dipping sauce is nut-free (!) because it’s based with sunflower seed butter. If you’d rather, peanut, almond, and cashew butter work well here, too. Look at that saucy goodness. These would make the perfect side or snack when you’re craving something healthy yet filling. 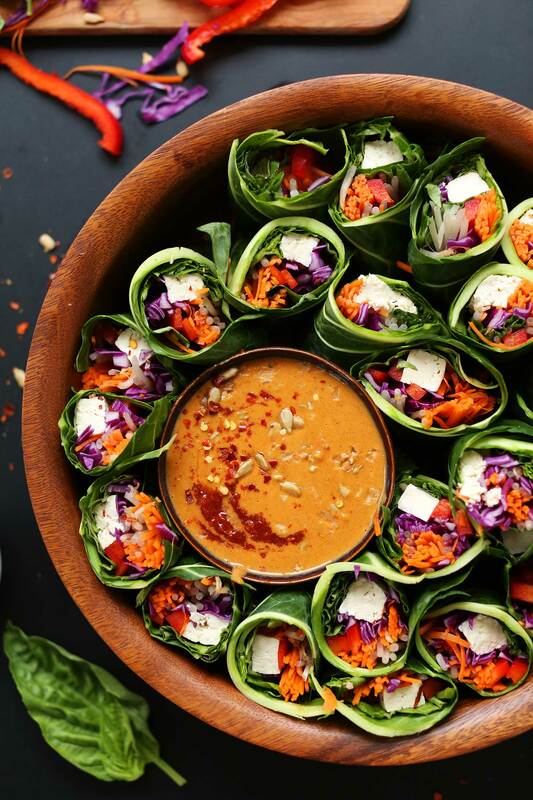 Our Thai Noodle Bowls with Almond Butter Tofu would be an excellent main dish to pair with these rolls! If you’re into spring rolls, check out our Rainbow Spring Rolls with Ginger Peanut Sauce, Pad Thai Spring Rolls, Banh Mi Spring Rolls, Vietnamese Spring Rolls with Crispy Tofu, Quinoa Spring Rolls with Cashew Dipping Sauce, and Thai Spring Rolls with Cashew Dipping Sauce. If you try this recipe, let us know by leaving a comment, rating it, and tagging a photo #minimalistbaker on Instagram. We’d love to see your spring rolls in action. Cheers and happy 2017, friends! Spring rolls with a twist! 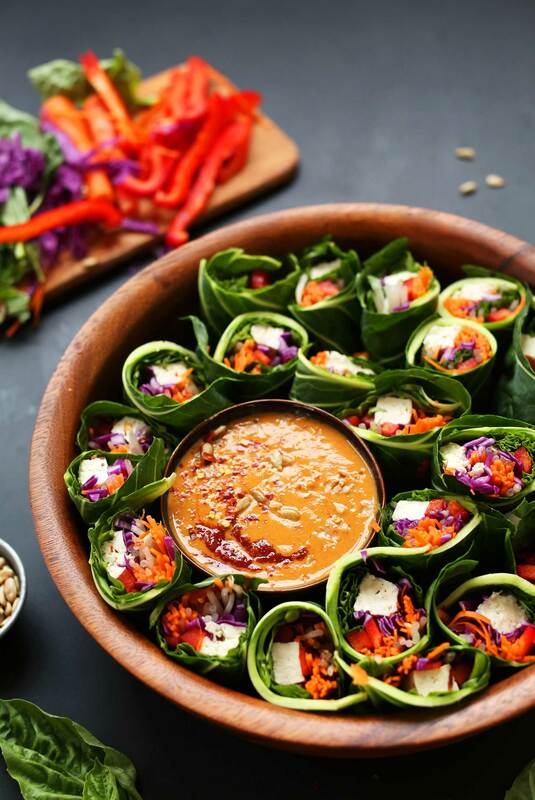 Veggies + tofu wrapped in collard greens and served with a spicy-sweet sunbutter dipping sauce. A satisfying and healthy plant-based snack or side. Start by wrapping your tofu in a clean, absorbent towel and setting something heavy on top (such as a cast-iron skillet) to drain the excess liquid. In the meantime, prep the collard greens by chopping the stems off and using a small, sharp knife to slightly shave/trim down the thickness of the stems at the base of the leaf. This isn't a necessary step, but it will allow it to fold/roll more easily. Next, prep vegetables and slice the tofu in long, rectangular cubes. Arrange on a tray or cutting board (see photo). 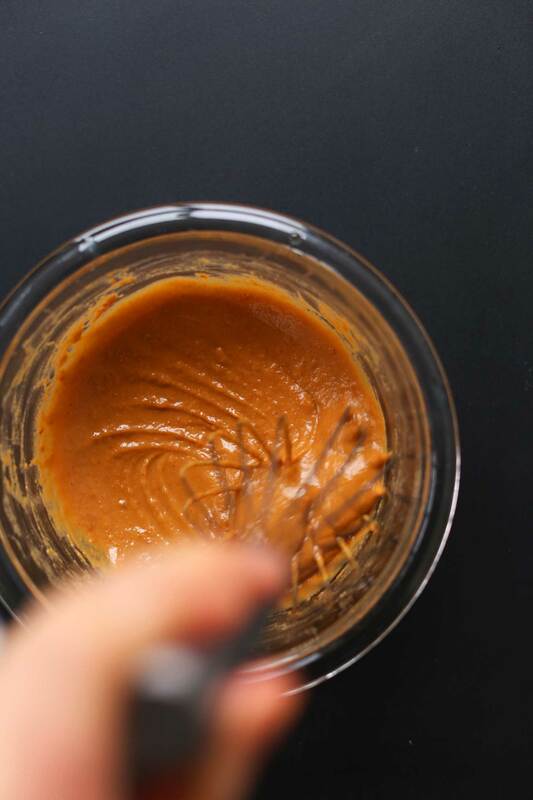 Prepare dipping sauce by adding sunflower seed butter, tamari, maple syrup, lime juice, and chili garlic sauce to a small mixing bowl and whisking to combine. Add enough warm water to thin into a thick but pourable sauce. Taste and adjust flavor as needed, adding more lime juice for acidity, chili garlic sauce for heat, maple syrup for sweetness, or tamari for saltiness. Next, lay a collard green down on a flat surface, and near the stem, layer on basil, tofu, red pepper, cabbage, bean sprout, and carrot (see photo). Use your hands to fold the collard green over once so the fillings are secured inside, and then tuck in the sides of the collard green and continue rolling until you have a loose spring roll. Lay seam-side down on a serving platter and continue until all fillings are used - about 11-12 rolls (amount as original recipe is written // adjust if altering batch size). To serve, I sliced my rolls in half and arranged them in a serving bowl with the dipping sauce (see photo). But you can also just leave them whole! These keep extremely well in the refrigerator up to 3 days, and the sauce will keep for up to 5-7 days (stored covered, separately in the fridge). *Pro tip! If you want to add more flavor to your tofu, after pressing and slicing, brush with tamari or soy sauce and roll in sesame seeds. *Nutrition information is a rough estimate calculated with ~1 1/2 Tbsp dipping sauce per serving. These were delicious, super simple, light but filling, and beautiful. In other words they were perfect! I followed directions as written with no modifications. Dipping sauce was great. I’ve never used sunflower seed butter before and I thought it was tasty. Making them again this weekend. Thank you for posting this recipe! These were great and fun to make. So purrty too. Doubled the sauce and served with Trader Joe’s Edamame. First time ever in 62 years trying collard greens. Great idea! These were delicious!!! Mine didn’t turn out so pretty but I think maybe my veggies and tofu were not sliced thin enough. I was in a time crunch. I think this would even be great as a “deconstructed” salad. I did have to add quite a bit of water to the dressing as it was very thick but it was quite tasty! I made these tonight & everyone loved them! Can you suggest a few recipe pairings with these rolls, for a dinner party please. Must be easy & not a lot of ingredients. It’s for a party of about 25 people. Thank you! Hi Corinne! 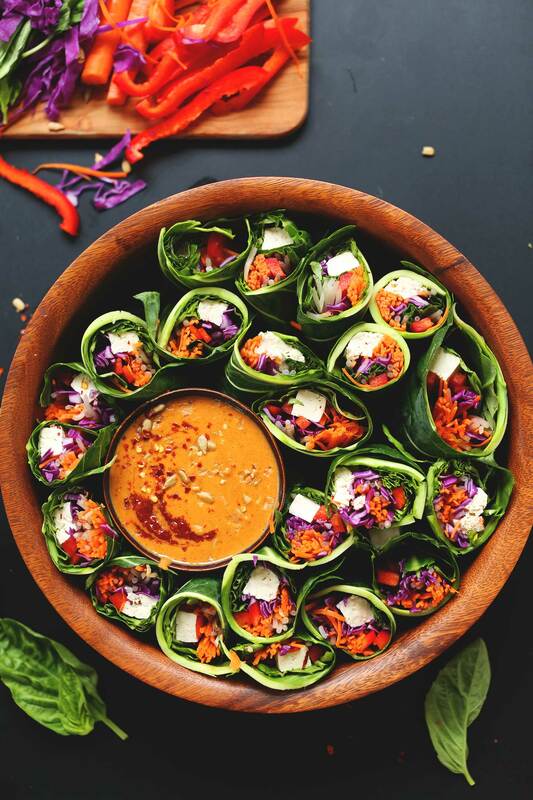 Our Thai Noodle Bowls with Almond Butter Tofu would be an excellent main dish to pair with these rolls! I made this tonight and my husband and I really enjoyed these! I steamed the collard greens first so they were easier to work with, and I used peanut butter for the sauce. We love anything that can be dipped in peanut sauce! Thanks, Dana! Loved these! I saw them on instagram on my way home and knew they had to be my afternoon snack. Super easy. I even took the leftover tofu and sauce and made stir fry for dinner with a salad using the sprouts and cabbage (+ chickpeas). Oh yeah I also subbed peanut butter for the sunflower butter and it worked amazingly! Would macadamia nut butter work instead? Hi! We haven’t tried it, but if you do let us know how it goes! Wow! These are so great! I love that I can make them and pack them for lunch the next day! I have never tried Sunbutter…uhm…where have I been…so fantastic. I have been plant based for two months as I am trying to figure out my joint and muscle pain and if it is food related. Your site has been such a blessing! Love your recipes! These were delicious, filling, and really easy to make! I was too lazy to trim down the collard greens all the way, so they were a bit difficult to roll and a few of them kept unraveling, but we were still able to eat them like a lettuce wrap. This came together quickly and were so pretty — it felt like we had a special meal even though it was a work night and we were completely pressed for time. We will definitely be adding this to our weekly rotation. I’ve tried many of your recipes and am a huge fan and follower! Also I am a gigantic fan of collard greens, especially as a wrapper, which I have tried myself, but with steamed and softened leaves. I want to try these with the raw veggies, but how the heck do you keep them from unrolling? And that stem is too chewy for me. Just wondering if there’s any tips/tricks to these being hand held. Rated it but the page glitched! My family loved this veggie loaded delight! The bright colors and crunchy textures were a welcome respite from the bleak snowy weather we are experiencing. In an effort to emulate one of our favorite collard rolls from a local restaurant, I omitted the tofu and added slivers of mango. A great base recipe to work with and modify to taste and available ingredients. These are delicious! Everyone enjoyed them, including my tofu averse son :) They keep well, so when I make a batch, I have leftovers for work lunches – major bonus! As always, Dana, this was fabulous! Easy to make, beautiful, healthy, and delicious! I cut down the recipe a bit and it made 4 perfect lunch-sized portions… and my colleagues have all commented on how wonderful it looks! I used peanut butter instead of sunflower seed butter and it was great. This were so amazing that we ate them 2 nights in a row. They keep very well in the refrigerator. Actually I’m craving them again tonight. This will be in heavy rotation on our weekly dinner menu. I can’t say this enough – every recipe we try of yours we love. Alyways becomes our newest favorite. These look amazing! 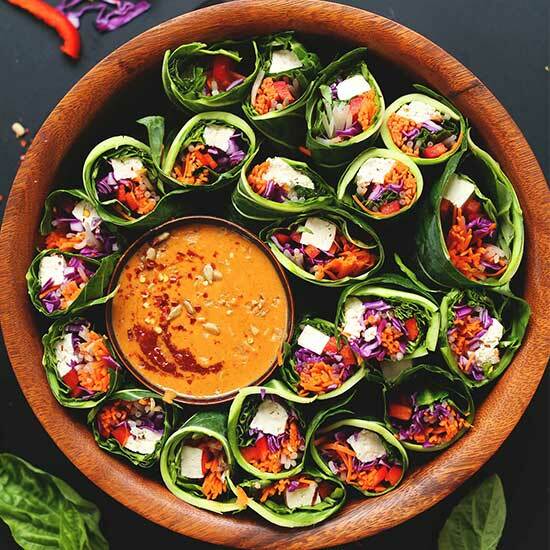 I love fresh spring rolls and have had collard wraps on my to do (and to eat!) list for way too long. Although, I often find the collards in my local health food store don’t look that great, do you think chard leaves would work? I also haven’t been much of a fan of sun butter in the past, but I had a jar in the pantry and recently made a dip similar to yours and now I’m sold, loving sun butter, will give your recipe a try too. And lastly, I love your tofu tip! I usually cook my tofu really simply in a pan with some coconut oil and flaked sea salt (super yummy), but sometimes there just isn’t a lot of time and if I can skip a step I’m all for it, definitely going to try rolling my tofu in soy sauce and sesame seeds, sounds delicious. Hi! I think chard leaves will work, but I haven’t tried it myself! Kale would work nicely too! Thanks! Gotta love kale, maybe I’ll try both. I made these and I was a little nervous because I like health but not things that taste too healthy. I was worried the collard greens might be too aggressive but they weren’t. I ended up subbing chix for tofu (I don’t do processed soy), adding mint, nixing sprouts and added a ton more chili paste and did the sauce with almond butter instead of sunflower. It was so tasty and great. Thanks for the recipe and inspiration. And for teaching me that collard greens raw are delicious! I made these in addition to the coconut curried greens, and both are perfect for lunches throughout the week! I’m avoiding peanuts, so in place of the PB I used a mixture of almond butter and tahini. It is delicious. Thank you for the wonderful recipes Dana! These were great. So many veggies is a such a small, beautiful package. A TIP: I stemmed + steamed the collards before rolling though. I can’t stand to eat raw collards. Yum, so fresh! I love all these brightly coloured veggies to start the new year off right! I used cilantro in place of basil, added chopped cucumber, and made the dipping sauce with peanut butter. Can’t wait to try them with basil! Thanks for this great recipe! I made this recipe last night and already feel pretty strongly that these need to be rolled up every week for my snacking pleasure. I love that they have a wide variety of veggies in one easy bite, they’re basically a nutritional powerhouse in one tasty little roll. These look amazing!! I love spring-rolls. (And lunches that keep for days!!!!) This dipping sauce looks to die for also! Although I have to admit, I have never used sunflower seed butter. Excited to give it a go, but I assume almond butter would be a mild enough flavor to also work? Well first i want to say how much i appreciate you posting so frequently. I check your page every day and most of the time it is the highlight of my day. You guys must work so hard and have helped me discover my burning passion for cooking. So thank you so much for all you do! 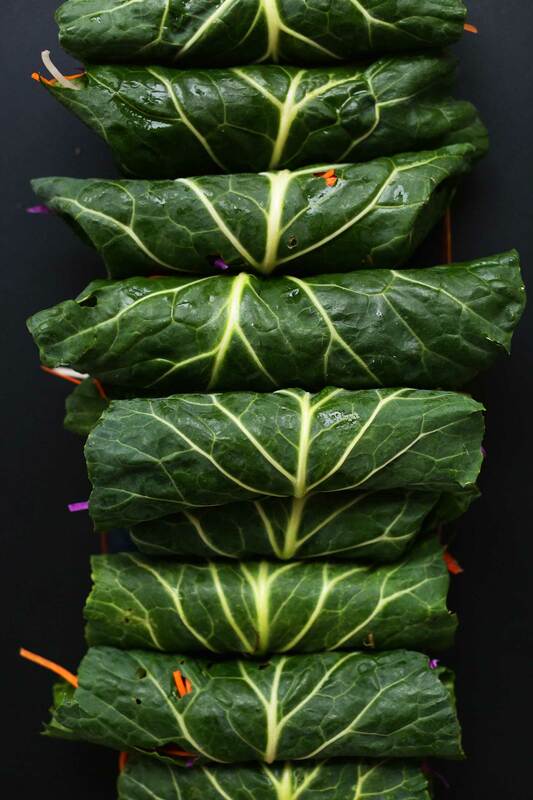 i havent made these (yet) but this post inspired me to sign up for a local CSA because local collard greens are so plentiful here and these wraps look amazing and i loooove sunbutter! These are so pretty! The prep was quick and easy and they turned out delicious and filling. I especially love the sauce :) Happy to have these in the fridge to snack on for the next few days. Thanks for another great recipe! I am SO into this dish. Brilliant Dana-thanks!!! These rolls are so vibrant and pretty! Also, I love the sound of that sunbutter dipping sauce. The colors in this post jump right off of the screen! What beautiful shots! Love this post. Maybe if I had eaten more food like these spring rolls during the holiday season, I wouldn’t have this stomach bug right now :| Well, here’s to making better choices in 2017!! I’m already subscribed — do I already have access to your detox guide?? Your recipes are amaaazzzzing! Thanks Shari! Yes, you should have access. If you have trouble email support! oh I will be making these for sure. At least once I stop making your red curry cuz I can’t stop…. Talk about eating the rainbow, this is the perfect dish for anyone wanting or needing to eat a rainbow of colors to clean up their diet. Absolutely beautiful. I am craving a Vegan Pho broth. I have recently found Rapunzel vegetable bouillon on Amazon. I have tried both Vegetable Bouillon with Herbs and the Vegetable Bouillon with no Salt added. The are delicious! I had various things to make a Pho broth. I don’t have it just right, and wondered if you have made a Pho broth and I could get the recipe. I make the broth and then have additions for each person to choose to add. What do you do? TY Dana! I will be making it tonight! Is there a tofu substitute that will be good for this recipe? Hi! Hmm tempeh or sautéed mushrooms perhaps? I haven’t tried it but if you do, let me know how it goes! Happy cooking! Hemp tofu! It is sooo delicious. I’m allergic to soy and discovered hemp tofu a few months ago. Life changing. So good. I buy it at Whole Foods. Btw, I have never been able to find the plain flavored and just use the paprika or basil flavored hemp tofu. It has made a wonderful substitute for all my favorite tofu dishes i could no longer eat. I’m fairly new to your blog and I must say that I just love your recipes – and your presentation. They look great! I can’t wait to try them. Because they are so appealing, they will add variety and be a nice change to getting my children to eat their veggies! Thanks for sharing! Forgot to add that I thank you for the sauce recipe because I can never get that right! Will try yours as it sounds just right. This is my first time on your site and this recipe happens to be one of my favorite I make at least once a week (pretty much exactly like yours but I lightly bake my tofu in coconut oil with curry powder). For those who have not tried this yet, it is so good! I crave this all the time. I’m a fan of all your various spring rolls, so satisfying and filling without making me sluggish–and your sauces are flavorful so a little goes a long way! I have a couple of questions in general for these rolls. I have never been able to find the BROWN rice wrappers you mentioned in your Pad Thai rolls, so if anyone has a source I would appreciate the info. Also, I see the rolls in the stores for sale in the deli/fresh meal section but if I try to do them ahead of time (for a work lunch, etc.,) they get gloppy and sticky and fall apart. Any tricks for keeping them for a few hours so I can have them for lunch? I am an ICU nurse working 12 hour shifts so I have to plan ahead for my meals. Thank you, Cheers, and Happy New Year! The beautiful thing about these rolls is they don’t get sticky and actually stay in the fridge very well for a few days! As for traditional spring rolls, I don’t usually have luck with them lasting more than 2-3 days. They’re best when fresh. And to keep them from sticking together, wrap individually in parchment or plastic wrap! Thanks Dana, if I come across some decent looking Collards I will give this a try but do love the rice wrappers and will try your tip next time I make them–just wondered how they keep them from turning so sticky and fragile at the grocery store meal counter since they are not wrapped? Omg – this looks super delicious! I have to try this. Happy New Year! Looks great! A different take on your rice wrapper spring rolls which we love! Unrelated cookbook question- for the Harissa pasta recipe, do you blend the almonds with the skins on, or blanch them first? Worried blending unsoaked almonds with skins on will add gritty texture or bitter flavor, so I just wanted to confirm before making this for guests tonight. Thanks! Blend with the skin on! This looks delicious. I love the idea of sunflower seed butter! These look fabulous! Such a great recipe to kick off the new year!